NaNoWriMo | ...Prepare to Die. I’m happy to announce that I completed my first NaNoWriMo EVER! My manuscript, Awaiting the Eclipse, is obviously going to need a lot of work, but the foundation is there! For now you can read a teeny tiny sample of it on my NaNoWriMo page! Now I just need to edit it, and submit to the publishers I chose at the start of the month! But for now, can I just say…? Or at least I’m going to try this year! I’ve tried twice in the past, but never won. Feel free to add me on NaNoWriMo.org! I’ll also be doing updates on my Twitter. Good tips! I’ve been thinking of doing NaNoWriMo this year (finally). 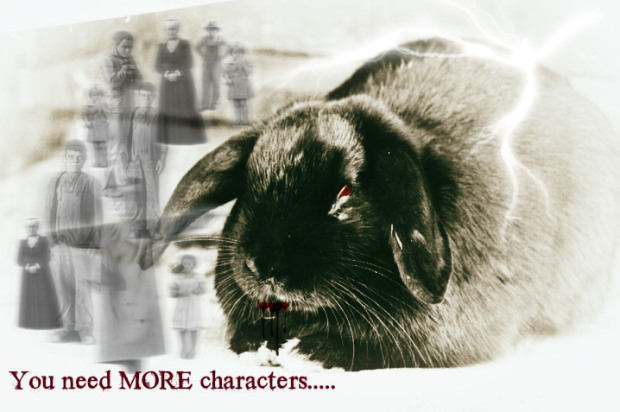 Attack of the Killer Plot Bunny. That rabbit is DYNAMITE! I promised not to leave you guys hanging with my last post. Now that I have a lot of you beating your shields ready for NaNo, I’m going to give you battle tactics to come out victorious (or maybe at least alive). Sure, NaNo is great to just learn to turn off the Inner Editor and get those 50,000 words DOWN. But, if in the end, all we have is a gelatinous ooze that eats people and attacks the city? They call in the National Guard to take out our WIP, because no revision can tame it. What to do? This post is incredibly redacted, but it’s a blog. So roll with it 😉 .